This story was written by CBS News correspondent Cami McCormick, embedded with U.S. forces in Baghdad. In this fertile, rural area of southern Baghdad, date palm trees line the east bank of the Tigris River, often hiding a deadly enemy. Snipers use the trees for cover to fire on U.S. troops. Insurgents plant roadside bombs and then disappear into the groves. The U.S. military bulldozes the trees along at least one road it uses frequently. While much of the focus has been on the sectarian violence in Baghdad, the Sunni insurgency here shows no signs of abating. Arab Jabour is one example of why President Bush is pressuring the Iraqi leadership to become a more representative government. The government's current security forces are made up largely of Shiites, who are unwelcome in this predominantly Sunni region. So U.S. forces often go it alone. "This is an area where the terrorists have been able to gain and maintain a sanctuary," said Col. Michael X. Garrett, Commander of the 4th Brigade, 25th Infantry Division, because until now U.S. military forces haven't "routinely operated here and there are no Iraqi forces, army or police." The population of Arab Jabour is estimated at 120,000, and 90 percent to 95 percent of them are Sunni. It is bordered by predominantly Shiite areas to the north, in Baghdad, and to the south, by towns like Mahmudiya. A national police checkpoint sits on the main road to central Baghdad, intended to stop weapons from flowing in and out of the capital, but the police officers are mainly Shiite and the Arab Jabour residents don't trust them. "We're up against a Sunni-based insurgency that is dissatisfied with the Iraqi government," said U.S. Army Lt. Col. Mark W. Odom, the commander of the 1st Squadron, 40th Cavalry, which deployed to this area two and a half months ago as part of the 4th Brigade. "They think the government does not support them with basic services like electricity, food and fuel vouchers. They view the Iraqi government as essentially supporting Shiite militias," he added. Although victims of sectarian violence have turned up along the area's borders with Shiite neighborhoods, the local Sunnis often take out their anger on Coalition forces. "Ninety to 100 percent of the area's residents either actively or passively support the insurgency," estimates Odom, who calls them well-armed and well-trained. On a scale of one to 10, he gives them the highest mark as worthy opponents. "Clearly, many of them have been in the military, based on the engagements we have had. Their tactics, their employment of indirect fire systems, indicates something beyond just paramilitary training," Odom says. And it's not just the military training that makes them so deadly, it's an engrained ideology. Odom says a 14-year-old boy was caught recently laying an improvised explosive device. One alleged sniper was just 16. "It takes us a while, mentally, to adapt to the fact that when you see a 15- or 16-year-old kid he could very well be the individual that's placing the improvised explosive device in the road, or behind the sniper rifle," Odom said. "That's conceptually, mentally, difficult to grasp, particularly for our young soldiers who haven't seen that before and are now coming to grips with it." With the daily threat to military vehicles and personnel from IEDs and small arms fire, the 1st Squadron has brought with it a special dismounted Charlie Company. This is its first deployment. It includes small counter-sniper teams that search for gunmen. The team also performs reconnaissance, traveling muddy roadways where IEDs are often hidden in sandbags to fool U.S. forces, or they're detonated, most recently, by strings of Christmas tree lights. Tanks and Stryker vehicles now line one of the most dangerous routes, civilian vehicles have been banned and palm trees have been cleared on either side of the road by U.S. tanks. Once the unit reaches a spot near the Tigris River where weapons caches were recently found, the two dozen or so soldiers set out on foot through the muddy fields, jumping ditches, and taking cover behind mounds of dirt or in the reeds along the river. Enemy gunmen fire twice in the vicinity of the soldiers. In both cases the Americans escape (although the company's machine gunners open fire and give chase in one instance). 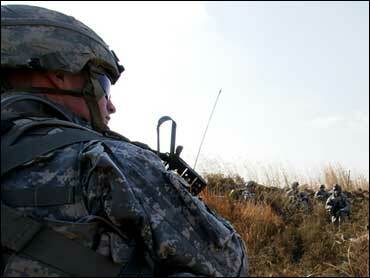 An IED explodes in the distance and some of the soldiers pause briefly to look toward the smoke. The unit commander says the action that day was typical. American forces are at the forefront of the battle here against Sunni insurgents. As in Anbar province, U.S. commanders are generally clear who the enemy is. But unlike in Anbar, where the U.S. military has enlisted local sheikhs, the Americans here have no visible Iraqi support. While an Iraqi army battalion works with the 1st Squadron, its 300 men fall far short of what the total number should be — closer to 700. "They're being attacked the same way Coalition forces are," said Odom. He says their makeup is slightly more Sunni than most Iraqi battalions, but it's still only accounts for 30 percent of the 300 men. More Sunnis will also be needed for a local police force. "Getting police in here to operate effectively will depend on having at least a 50 percent composition of Sunnis. They're working very hard to make the police force representative in the areas that it operates in and to be equally representative of all the religious and ethnic groups. It will be extremely important," said Odom. Col. Garrett calls it his biggest challenge. "We can go in and clear any area but until there is an Iraqi security structure to come in behind us, and establish a long term presence, true progress in this area will be difficult to achieve," said Garrett.